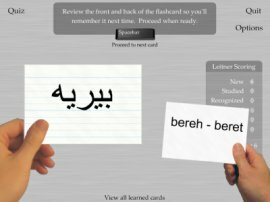 Flash My Brain - Study Arabic with Flash My Brain Arabic flash cards. Study Arabic with Flash My Brain Arabic flash cards. Easily print out beautiful Arabic flash cards using the print interface shown at the left. You can print out your cards onto paper, cardstock, or even transfer them to your iPod or cellphone. Today's world needs more Arabic speakers and Flash My Brain helps you learn this rich and challenging language faster and better. Flash My Brain has an extensive flash card learning module including games, Leitner memorization, and a natural review interface. With Flash My Brain, you can learn online or offline: at home, at school, or at work. Buy Flash My Brain for 29.95 and start studying Arabic flash cards the Flash My Brain way.